Solar Margins About to Shrink? At Greentech Media's Solar Market Outlook on Tuesday, the Prometheus Institute president says capacity will grow 70% in the next few years, while demand grows less than 40%, reducing prices and margins. Travis Bradford, president of the Prometheus Institute, said Tuesday that he expects the worldwide production capacity for solar panels to grow from 1.87 gigawatts in 2006 to well over 10 gigawatts in 2010 and to between 40 and 60 gigawatts by 2015. 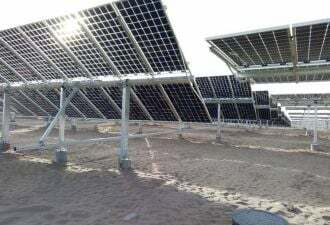 At Greentech Media’s Solar Market Outlook, Bradford said the U.S. market could reach 1.59 gigawatts of installed solar capacity in 2010, up from 259 megawatts of installed capacity in 2007. To reach these numbers, Bradford expects that solar-power system prices will be cut in half by 2010, reaching $4 per watt for fully installed systems. Module prices, which make up about half the system costs, already are dropping an estimated 20 percent -- from $3.95 per watt to $3.15 per installed watt -- this year, according to the Prometheus Institute, which is a partner of Greentech Media Research. Lower prices will result when production increases beyond demand, Bradford said. Today, solar-panel manufacturers are able to sell nearly everything they make because of a worldwide shortage of solar-grade silicon that has constrained supply beneath demand. The supply of solar panels will grow 74 percent in 2008 and 75 percent in 2009 while worldwide demand grows 37 percent and 39 percent, respectively, he said. "Each year, supply should grow by 70 percent or more than 70 percent, while demand … is not growing at anywhere near those rates," he said. As a result, the industry will be faced with lower margins for a few years, he said. Thin-film solar manufacturers could see better margins than those with traditional crystalline technology in that environment, said Bradford, who expects thin films to make up 22 percent of the market in 2010. Of course, these figures aren’t sure things. Demand makes up only half of the equation and much of the demand will be determined by government policies, as well as cost. While Bradford expects 6.5 gigawatts of worldwide demand in 2010, the demand could range from 4.3 gigawatts to 8.66 gigawatts depending on decisions from the German and U.S. governments, among other things. The industry is holding its collective breath to find out how much Germany’s feed-in tariff, which jumpstarted the market, making the country the largest solar market today by far, will drop. That’s expected to be decided in December. And programs in Japan, Italy, France, Greece, South Korea and China also could vary widely as details get hammered out, Bradford said. For example, some countries -- particularly France -- are very focused on aesthetics, which might slow some initial growth, he said. And some of the programs -- such as potentially in France, Italy and Korea -- are likely to favor domestic producers, making them less valuable for manufacturers outside of the countries offering the incentives. "My belief is, in a lot of these programs, there will come a time when domestic producers are under stress and [the countries] will find that it makes more sense to deploy these systems domestically," he said. As for the United States, Bradford expects individual U.S. states will create a demand of about 7.2 gigawatts, through incentives and policies requiring renewable energy, by 2015. And a federal solar incentive provides tax credits worth 30 percent of the cost of solar-power systems, up to a cap of $3,000 for residential systems but with no cap for commercial systems. But the credit, set to expire in 2008, is in danger. A longer version of the credit was part of the energy bill passed by the House, but not the Senate, and industry insiders say the credit -- along with a national renewable portfolio standard, which would require utilities to get 15 percent of their power from renewable sources -- might be cut out as Congress tries to reconcile the two bills (see Renewable Tax Credit and Portfolio Standard Could Get Cut From Energy Bill). If it’s true and the credit gets cut, that could lower demand -- and the U.S. solar projections, Bradford said. "To get to 1.5 gigawatts by 2010 requires pretty perfect action on the part of the states," he said. "There’s not a lot of upside because there is lag time and … these are new markets." While there are fallback plans, the potential cut "strikes fear into the hearts of the industry," Bradford said. "Thank you, our elected representatives." Solar stocks plunged Friday and Monday as investors reacted to the news, then bounced back Tuesday (see Solar Stocks Bounce After Hitting Bottom). Considering that most of the solar market is in Europe, Jeff Osborne, an analyst and managing director at Thomas Weisel Partners, said the drop showed that U.S. investors "tend to by overly myopic" and called it an "overreaction." Still, the investment environment could impact companies hoping to make initial public offerings, he said. Some solar companies will probably want to wait until the tax credit issue is resolved, although he said equipment manufacturers can come out at any time. But Asian, and especially Chinese, companies might want to wait because investors are skeptical right now, Osborne said.